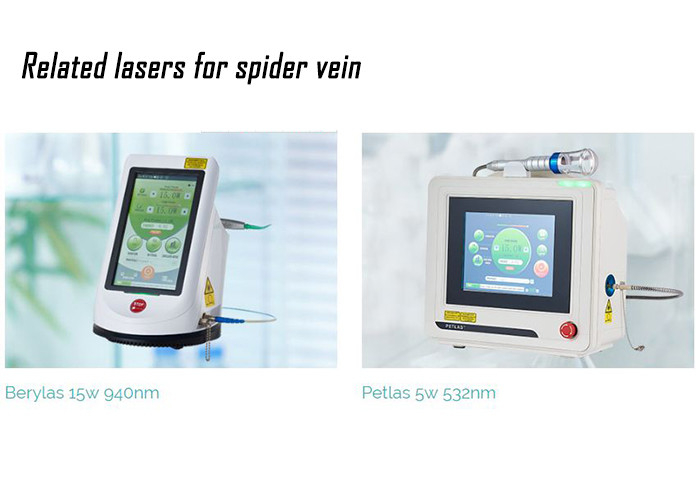 We two different lasers for spider vein removal. The combination of different lasers allows us to give you the safest most effective treatment. We use longer wavelength lasers ( 1064 or 810 diode laser) for larger deeper veins and a shorter wavelength laser (532 KTP laser) for smaller more superficial veins. The laser treatment works by passing light through the skin heating up the blood in the vessel causing thermocoagulation of the vessel. The clogged vessel is then slowly absorbed by the body. During laser spider vein treatment, the laser is applied to the skin over your spider veins. The laser light is absorbed by the red veins and causes your spider veins to coagulate and shrink.Treatments do not require sedatives, pain medications, or injections of local anesthetic. Immediately following treatment, spider veins will be darker and more visible. Over two to six weeks, your spider veins usually fade. After each treatment, you will see a significant improvement in the appearance of face spider veins and leg spider veins. An average of three treatments will be required.